When to initiate antiretroviral therapy in HIV infected patients is a diffcult clinical decision. Actually, it is still a matter of discussion whether early highly active antiretroviral therapy (HAART) during primary HIV infection may influence the dynamics of the viral rebound, in case of therapy interruption, and overall the main disease course. In this article we use a computational model and clinical data to identify the role of HAART timing on the residual capability to control HIV rebound after treatment suspension. Analyses of clinical data from three groups of patients initiating HAART respectively before seroconversion (very early), during the acute phase (early) and in the chronic phase (late), evidence differences arising from the very early events of the viral infection. The computational model allows a fine grain assessment of the impact of HAART timing on the disease outcome, from acute to chronic HIV-1 infection. 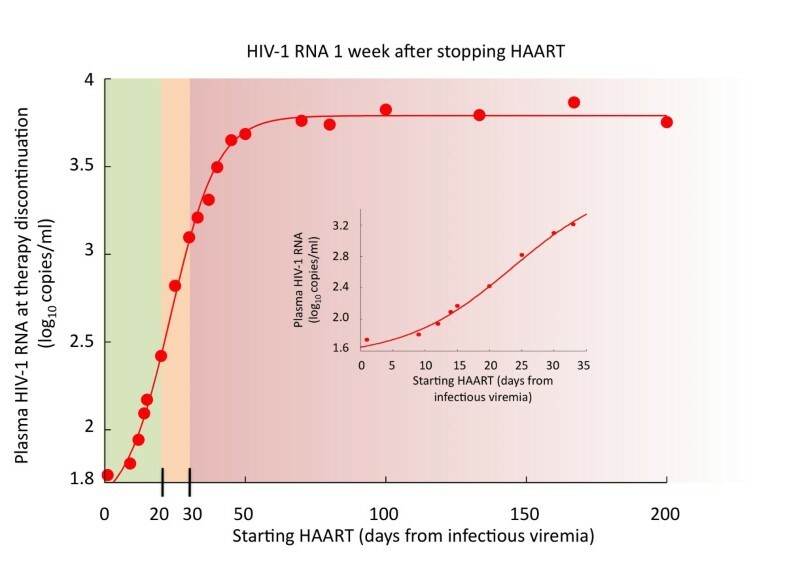 Both patients' data and computer simulations reveal that HAART timing may indeed affect the HIV control capability after treatment discontinuation. In particular, we find a median time to viral rebound that is significantly longer in very early than in late patients. A timing threshold is identified, corresponding to approximately three weeks post-infection, after which the capability to control HIV replication is lost. Conversely, HAART initiation occurring within three weeks from the infection could allow to preserve a significant control capability. This time could be related to the global triggering of uncontrolled immune activation, affecting residual immune competence preservation and HIV reservoir establishment. The question of when antiretroviral therapy has to be initiated remains a challenging issue. Recent studies show that the early immune response to HIV-1 infection is likely to be an important factor in determining the clinical course of disease . 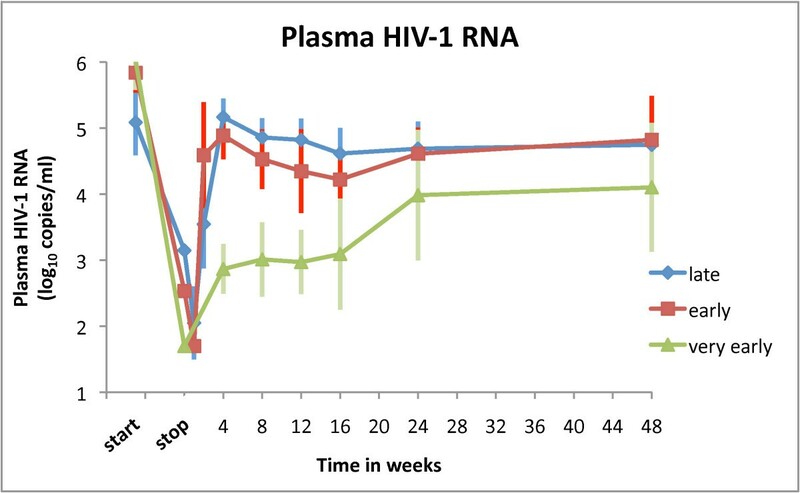 The first weeks following HIV-1 transmission are extremely dynamic. They are associated with rapid damage to generative immune cell micro-environments and with immune responses that partially control the virus. Following HIV-1 infection, the virus first replicates locally in the mucosa and then is transported to draining lymph nodes where further amplification occurs. This initial phase of infection, until the systemic viral dissemination begins, constitutes the eclipse phase . In general, there is an exponential increase in plasma viremia with a peak 21-28 days after infection. By this time, significant depletion of mucosal CD4+T cells has already occurred. Around the time of peak viremia, patients may become symptomatic and reservoirs of latent virus are established [1, 2]. The "window of opportunity" between the infection and peaking of viremia, prior to massive CD4+ T cell destruction and the establishment of viral reservoirs, seems to be a narrow but crucial period in which an antiretroviral therapy can control viral replication, prevent an extensive CD4+ T cell depletion from occurring and curb generalized immune activation. Thus, thwarting HIV replication by introducing HAART in the early phases of infection could have a substantial impact on the whole disease course. In particular, suggested factors that may contribute to the observed better viral control after treatment interruption in very early treated patients are : i) early arrest of viral escape, leaving the virus vulnerable; ii) preservation or even enhancement of the immune response resulting from the early clearing of antigen; iii) prevention of the establishment of a pool of HIV-specific memory CD4 T cells thus leaving fewer target cells available for viral infection. An ideal clinical model aimed at addressing such issue should compare a number of patients treated starting on different times: from very early to very late. Besides the ethical issues, it is rather difficult to collect enough patients to significantly represent the whole spectrum of possible HAART initiation timings. As a matter of fact, a practical clinical model would compare very early to late-treated patients. While informative on the overall role of HAART timing on disease course, this approach would not allow to verify if there are events in the early infection influenced by the starting time of HAART that affect directly and decisively the course of the disease. We have already shown in [4–6] that an agent-based model of HIV-1 infection could be a valuable tool for the study of the AIDS disease progression and treatment. The computerized simulation allows us to track the effect of HAART timing on the progression of the disease. The aim of the present work is to verify the effect of HAART timing on subsequent events. Indeed, both a clinical model and a computational simulation show that a late initiation of treatment affects HIV-1 replication control. Interestingly, the in silico model identifies a significant three-week time threshold as the "ultimate" time point beyond which the decisive HIV-induced damages already occurred, affecting the whole disease course. In a previous work , we analyzed clinical data of patients initiating HAART within six months from infection (i.e., we called that early phase) and performed computer simulations to predict the differences in viral rebound at therapy interruption between those patients and subjects initiating therapy during the chronic phase (i.e., we called that late phase, corresponding to initiating six or more months after infection). Our conclusion was that early initiation of therapy does not prolong the disease-free period when compared to a treatment started during the late phase. However, other studies suggest that an earlier initiation is preferable [7–9]. This motivated us to better identify the meaning of early initiation. In the present article, we extend the analysis in  to get a more complete picture. We analyze clinical data of very early patients (i.e., treated before seroconvertion) against late-treated patients. We analyzed the results of clinical studies performed at the Clinical Department of the National Institute for Infectious Disease "L. Spallanzani" in Rome. A first group of eleven patients (9 male and 2 female) were diagnosed HIV-1 positive between year 1998 and 2006. All patients initiated HAART within 14 days from diagnosis, during the very early phase of infection (see Table 1). The very early phase was defined as having a negative or indeterminate western blot for HIV-1 antibodies in combination with a positive test for either p24 antigen or a detectable HIV-1 RNA concentration. Those patients were treated with zidovudine/lamivudine (CBV) in combination with either the reverse transcriptase inhibitor efavirenz (EFZ) or one protease inhibitor lopinavir/ritonavir (KAL) or indinavir (IDV). Because anaemia and neutropenia were diagnosed, in two cases CBV has been substituted with lamivudine (3TC) and staduvine (D4T). All those patients underwent a therapy cycle for 2 ± 1 years and remained off HAART for about 48 weeks. Very early subjects with an immediate treatment before seroconversion. Clinical information about the eleven patients selected at the Clinical Department of the National Institute for Infectious Disease "L. Spallanzani" in Rome. All subjects received HAART within six months from primary infection. †CBV, Combivir (AZT Zidovudine plus 3TC Lamivudine); IDV, Indinavir; EFZ, Efavirenz; KAL, Kaletra (lopinavir/ritonavir). ‡ Days elapsed from diagnosis (enrollment) to initiation of HAART. *CD4 and CD8 are per microlitre of plasma, viremia is per millilitre of plasma. ** 4 weeks after treatment interruption. The second group is made up by twenty-two patients (21 male and 1 female) enrolled in the program between year 1998 and 2005. Patients in this group underwent HAART during the early phase of HIV-1 infection. In particular, they started HAART about 20 days after treatment diagnosis (see Table 2). Early patients were defined as having documented seronegative HIV-1 antibody test within the previous 6 months; acute symptomatic seroconversion illness; evolving HIV-specific antibody response by ELISA; positive HIV-DNA PCR in PBMC. Those patients were treated with three different drugs (in the majority of cases zidovudine (AZT) plus 3TC plus a protease inhibitor. Further details can be found in Table One of . All those patients underwent a therapy cycle for 3 ± 1 years and remained o HAART for about 88 weeks. Early subjects with an immediate treatment of acute HIV-1 infection. Clinical information about the twenty-two patients selected at the Clinical Department of the National Institute for Infectious Disease "L. Spallanzani" in Rome. All subjects received HAART within six months from primary infection. †D4T, staduvine; 3TC, lamivudine; IDV, Indinavir; AZT, Zidovudine; NFV, nelflnavir; EFV, Efavirenz; NVP, nevirapine; TNF, Tenofovir; Lop, lopinavir; Rit, Ritonavir; LPV (KAL), Kaletra (lopinavir/ritonavir). ‡ Days elapsed from diagnosis (enrollment) to initiation of HAART. *CD4 and CD8 are per microlitre of plasma, viremia is per millilitre of plasma. The third group consists of twenty-one patients (12 male, 9 female). They started HAART during the chronic phase of infection defined as suggested by the guidelines . In particular, they started HAART about 3.5 years after treatment diagnosis (see Table 3). Their CD4 count at initiation was 400 ± 150 per microlitre of plasma. The range of calendar year for starting HAART among those patients was 1998 ± 3. All those patients underwent a therapy cycle for 4 ± 2 years and remained off HAART for about 41 weeks. The Ethical Committee of the "L. Spallanzani" Institute approved the study and the patients gave a written informed consent. Late subjects with deferred treatment of acute HIV-1 infection. Clinical information about the twenty-one patients selected at the Clinical Department of the National Institute for Infectious Disease "L. Spallanzani" in Rome. All subjects received HAART during chronic phase of infection. †AZT, Retrovir (Zidovudine); 3TC, Epivir (Lamivudine); D4T, Zerit (Staduvine); SQV, Saquinvir (Invirase); Zalcitabina (ddC, Hivid); Rit, Ritonavir (Norvir); ddl, Didanosine (Videx); IDV, Indinavir (Crix-ivan); EFV, Efavirenz; NVP, Nevirapine (Viramune); LPV (Lop), Lopinavir; ‡ Days elapsed from diagnosis (enrollment) to initiation of HAART. *CD4 and CD8 are per microlitre of plasma, viremia is per millilitre of plasma. Plasma HIV-1 RNA levels were determined by a second-generation assay based on nucleic acid sequence based amplification (NASBA), for samples collected until 2001 and by the branched-chain DNA assay (Versant HIV RNA test, Version 3.0, lower limit of quantification 50 copies/ml; Bayer Diagnostics, Milan, Italy) from 2001 until 2008. The current version of the model we employ derives from an early simulator that has been quite extensively described in previous publications [11, 12]. Recently it has been specialized to simulate the HIV-1 infection  and the effects of antiretroviral therapy . Briefly, it resorts to bit strings to represent "binding sites" of cells and molecules, as for example lymphocyte receptors, MHC, antigen peptides and epitopes, immunocomplexes, etc. . The model includes the major classes of cells of the lymphoid lineage (T helper lymphocytes, cytotoxic T lymphocytes, B lymphocytes and antibody-producer plasma cells) and some of the myeloid lineage (macrophages and dendritic cells). These entities are individually represented. In contrast to cells, cytokines like interleukin-2 are represented in terms of concentrations and their dynamics described by a parabolic partial differential equation plus a degradation term accounting for the finite half-life [5, 14]. Modeling features of the HIV infection include HIV replication inside infected lymphocytes, T production impairment; specific response against HIV strains and HIV mutation. The simulated life cycle of the virus is represented by the following stages: 1) the virus infects CD4+ T cells, macrophages, dendritic cells; 2) reverse transcriptase copies the viral single stranded RNA genome into a double-stranded viral DNA. The viral DNA is then integrated into the host chromosomal DNA; 3) the virus remains at rest until an event activates the transcription; 4) the replicating virus buds from the cell membrane. Fully assembled virions are then able to infect other cells to restart the life cycle. HAAR effects are modeled as follows: Reverse transcriptase inhibitors block reverse transcriptase enzymatic functions and avoid completion of synthesis of the double-stranded viral DNA thus preventing HIV-1 from replicating (i.e., it prevents the virus in stage 1 from reaching stage 2); Protease inhibitors prevent viral replication by inhibiting the activity of HIV-1 protease, an enzyme used by the virus to cleave nascent proteins for final assembly of new virions (i.e., it prevents virus assembly in stage 4). Further details and parameter settings of the simulations can be found in the Additional file 1. For what concerns the setting of the parameters related to the therapy, we performed computer simulations in which we fixed the immunological parameters at the time of therapy initiation on the basis of the average values measured in patients in vivo: 5.8 ± 0.2 RNA copies/ml (in logarithmic scale), 870 ± 50 CD4 cells/μl and 430 ± 50 CD8 cells/μl. For all simulations we applied a one-year course of HAART. Further details on the tuning of the simulation parameters can be found in the Additional file 2. We analyze virological data from HIV patients treated during the very early, early and late phase of infection and compare them with computer simulations. In Figure 1 clinical data of all three analyzed groups is shown altogether. In a point-by-point comparison we find no statistical difference in viral rebound between early and late-treated patients (P ≥ 0.05, Mann-Whitney U two-tailed test) confirming the results of . In addition, we observe that a difference does exist for very early initiation of therapy (P < 0.05, Mann-Whitney U two-tailed test). Plasma HIV-1 RNA load. The mean plasma HIV-1 RNA load versus time in weeks after interruption of HAART for patients classified in late (21 subjects), early (22 subjects) and very early (11 subjects) groups. Error bars show standard deviations. The features of the three clinical settings are given in section Patients and Methods. In the present work we extend the simulations of  to include the new clinical settings corresponding to a very early initiation of therapy. In particular, the very early simulation settings correspond to a beginning of the therapy within the first week whereas the late settings correspond to initiating therapy between week five and six from infection. 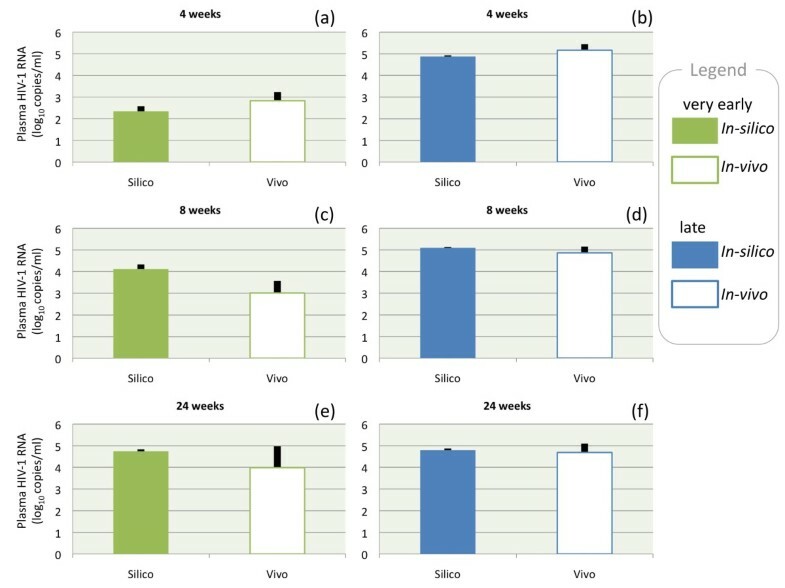 Figure 2 summarizes data of virological rebound (averages) after therapy interruption at different time points (4, 8 and 24 weeks) for very early and late patients for both clinical (empty boxes) and simulation data (filled boxes). Firstly, the figure shows that clinical and simulation data are in good agreement (differences are not statistically significant: P ≥ 0.05, Mann-Whitney U two-tailed test). Secondly, the difference in plasma HIV-1 RNA (copies/ml) between very early and late-treated patients decreases with increasing time from therapy interruption. Panel (a) shows a difference of about two logs with panel (b) for both clinical data and simulations. These differences vanish after 24 weeks from therapy interruption (cfr. panel (e) and (f)). The overall message is that a delay in the initiation of therapy reduces the chances of maintaining a therapy effect at discontinuation. Virological rebound. Virological rebound after 4 weeks (top), 8 weeks (middle) and 24 weeks (bottom) from therapy interruption for two groups: very early (green boxes) that started HAART before seroconversion and late (blue boxes) that started HAART during chronic phase of primary HIV-1 infection. Filled boxes represent in silico data (resulting from three thousands runs) whereas empty boxes correspond to in vivo data. We have calculated the Mann-Whitney U test statistics for assessing whether the two independent samples (in silico and in vivo) come from the same distribution. In all cases we did not find a significant difference (P ≥ 0.05, Mann-Whitney U two-tailed test). Black lines indicate standard deviations. Information on parameter settings for the simulations can be found in the Additional file 1. In order to provide a more precise estimate of the time "limit" beyond which the benefit of an early initiation of therapy vanishes, we use the simulation to investigate the influence of HAART initiation time (t s ) on the viral rebound. The corresponding results are shown in Figure 3. The virological rebound at one week after therapy interruption as a function of t s is presented. We observe that there are two regimens, one for t s < 20 days and one for t s > 30 corresponding to what clinicians call respectively best controllers (with undetectable HIV RNA levels) and rebounders (whose HIV viremia load returns, approximately, to the pre-HAART level). Virological rebound after 1 weeks. Virological rebound at 1 week after therapy interruption for different starting time points of HAART (t s ). The red dots represent the results of thousands simulations and the fitting line is given by the Richards' curve in equation 1. Standard deviation is about 0.1 log10(copies/ml) for all points. Inset plot is a zoom for t s < 30 days. Parameters of the fitting curve are: a = 1.52, k = 3.79, d = 0.12, and t s * = 23.50.
where the parameter k is the carrying capacity or the upper asymptote, a is the lower asymptote, d is the growth rate, and t s * is the time of maximum growth. By moving the time of the measurements beyond one week after therapy interruption, the resulting data still fit the same V (t s ) but with a greater a, a smaller d and a greater t s * . In particular the limit for d going to zero, of V (t s ) is (a + k)/2 may lead to the deceiving conclusion that there is no window of opportunity because the viral rebound is independent from t s .
With respect to t s * , the value of~ 23:5 days points to the early inflammation as a critical phase of the disease. To bring into focus this facet, we compare two simulated "markers" of the inflammation state in untreated (control case), very early and lately treated simulated patients (see Figure 4). These virtual markers are given by the cell counts of active macrophages (a) and dendritic cells presenting viral proteins on class II MHC molecules (b). We observe that the late-treated case is comparable to the control case (untreated) whereas the very early stands on its own. This observation suggests that it is the activation of the immune system through the set up of an in ammatory state that has to be blamed for the increased viral rebound for t s > t s * . Inflammatory response. Cell counts of active macrophages (a) and dendritic cells presenting viral proteins on class II MHC molecules (b) show that, in the simulation, the late-treated case is comparable to the control case (untreated) whereas the very early case stands on its own. This suggests that the set up of an infiammatory state affects the viral rebound at therapy discontinuation. Counts are taken at week 8 for all groups. Therapy for very early started within the first week and for the late started at about week 6. Figure 4 shows with clarity that very early initiation of the treatment can down-regulate the immune activation, hence limiting viral replication and spread. Interestingly, this view is supported by the observation that HIV triggers the immune activation directly (e.g., HIV gene products can induce the activation of lymphocytes and macrophages as well as the production of pro-inflammatory cytokines and chemokines ) or indirectly (e.g., sustained antigen-mediated immune activation occurs in HIV-1-infected patients due also to other viruses like the cytomegalovirus or the Epstein-Barr virus ). In both case, the result is a high level of pro-inflammatory cytokines, such as tumor necrosis factor alpha, interleukin 6 and interleukin 1 beta, right from the early stages of HIV-1 infection . Recent analysis (performed by Fiebig et al. ) of samples from individuals that have been infected by HIV-1 has revealed that patients can be categorized into six stages on the basis of a sequential gain in positive HIV-1 clinical diagnostic assays (viral RNA measured by PCR, p24 and p31 viral antigens measured by enzyme-linked immunosorbent assay (ELISA), HIV-1-specific antibody detected by ELISA and HIV-1-specific antibodies detected by western blot, ). Patients progress from acute to early chronic infection at the end of stage V, approximately 100 days following infection, as the plasma viral load begins to stabilize. With respect to the study conducted by clinical data analysis and computer simulation described so far, we identify three regimens, as highlighted in Figure 3. These can be paralleled to Fiebig et al. stages . In particular, we observe that patients treated with HAART in very early stages of the infection (stage I-III) are likely to better control the viremia after treatment interruption . If therapy starts in the acute phase (stage V-VI) then the action of the drug foils the immune response and, as a consequence, at the end of the therapeutic period, the virus rebounds undisturbed. These considerations are summarized in Figure 5 where we draw a schematic picture of the importance of an early initiation of HAART with respect to the progression of HIV markers according to Fiebig's et al. stages. In particular we identified the "window of opportunity" corresponding to stages I-III, that is, the first three weeks from primary HIV-1 infection. Patients receiving therapy in this narrow period are likely to turn out to be best controllers. Probably, the massive immune activation in the early stage of the disease favors the virus, as it finds more host target cells to exploit for replication. In point of fact, the ensuing massive depletion of CD4+ T cells in mucosal lymphoid tissues, can result in the disruption of the mucosal barrier in the gut. This barrier prevents the translocation of the intestinal flora from the gut to the systemic immune system restricting it to the lamina propia and the mesenteric lymph nodes . HIV-1 infection is indeed associated with a significant increase of plasma lipopolysaccharide levels that is an indicator of microbial translocation, directly correlated with measures of immune activation. Phase diagram. 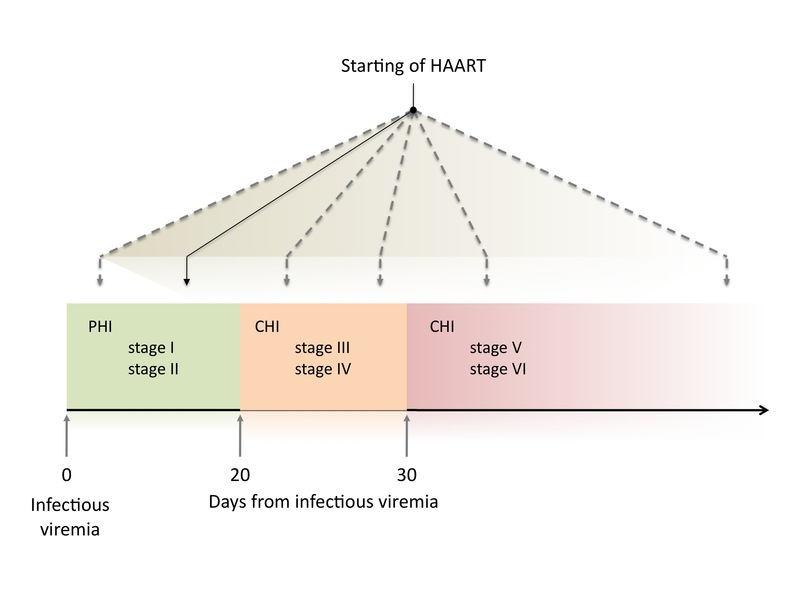 Schematic diagram of the importance of an early initiation of HAART with respect to the progression of HIV markers according to the staging in . A number of studies indicate that interfering with HIV replication by starting the therapy in the early phases of the infection could have a deep impact on the whole disease course. However, HAART is costly, it is onerous for both patient and health care provider, and often brings adverse effects. Its clinical benefit must therefore be weighed against its burden. In the present study, we resorted to a computer model to study the dynamics of the plasma viral load after prolonged treatment interruption in two groups of in silico patients: those who initiate HAART very early and those who start it lately. We evaluated the model comparing the results to clinical data. We found that an opportunity time-window exists for the initiation of HAART (roughly within three weeks before the establishment of viral reservoirs), in which the therapy can control viral replication, preventing generalized immune activation and extensive CD4+ T cell depletion. Paola Paci and Filippo Castiglione contributed equally to this work. We acknowledge Rossella Carello and Chrysoula Vlassi for assistance in data extraction. We wish to acknowledge support of the European Community through the contract FP6-2004-IST-4, No. 028069 (ImmunoGrid). We thank the "Consorzio interuniversitario per le Applicazioni di Supercalcolo Per Universitá e Ricerca" (CASPUR) for computing resources and support (Standard HPC grant 2009 and 2010). FC and PP designed and performed research; all authors wrote the paper. FM and GDO provided the clinical data. All authors read and approved the final manuscript.